These (F55 especially) are going to dominate the rental market if other manufacturers are not proactive. If they do what Sony claims they can, they're near perfect, which is tough to beat. The forecasted pricing screams "rental". The houses will love them, as I'm sure they trust Sony's customer support. Voldemort quoted the F5 at $15K to compete with the C300 market and the F55 at $25k plus extras, if this pricing is correct then these cameras will certainly set a new benchmark for price/features. The F5 kitted up will be in same price range as Red Scarlet package. come on RED, come back with the huge discounts please!! I think to really be competitive, not just for the release, but for the next few years... these really need to be priced in the ball-parks of $5k and $10k respectively. I'm not sure about where to place Epic's new price... but for Red to be competitive, even with other cams like the BMC, Scarlet needs to go down to about $5k. I kinda like the idea of a separate but close-mating 4K recorder, because you can own the base camera for less, and rent the 4K add-on unit as needed on a per-project basis. The forecasted pricing screams "rental". The houses will love them, as I'm sure they trust Sony's customer support. Absolutely. Reliability is a strong selling point. Yeah, it´s the right move IMO. Great to have the same possibility (although wired) with the fs700, too. Now I just want to see some moving images from this baby! Did you see this page, Sir? I continue to see these price projection everywhere, even in Europe. Some suggestions? "European prices for the cameras have not been announced, but a conversion of suggested retail prices released by Sony Japan indicates the F55 will cost around £22,3500 (¥2,887,500) and the F5 approximately £13,400 (¥1,732,500)." Both cameras are expected to ship early next year." Thanks for the article on color filters. It was a good read. 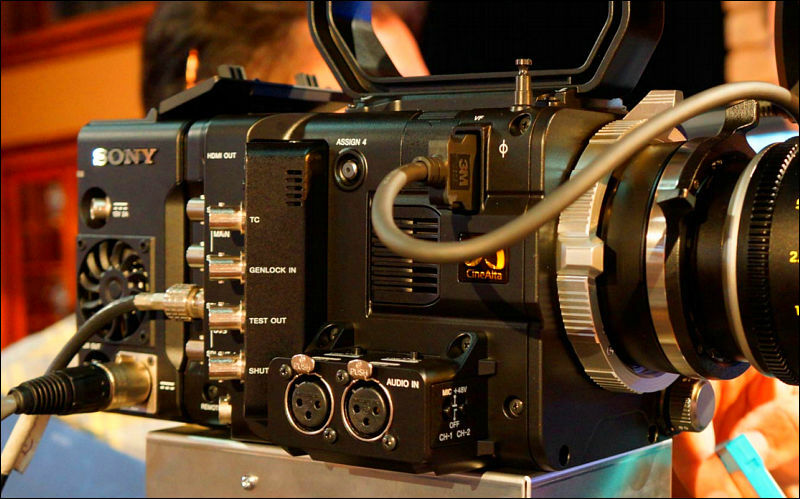 I think the F55 is one of the reasons there has been so little activity from Panasonic in the last 18 months. 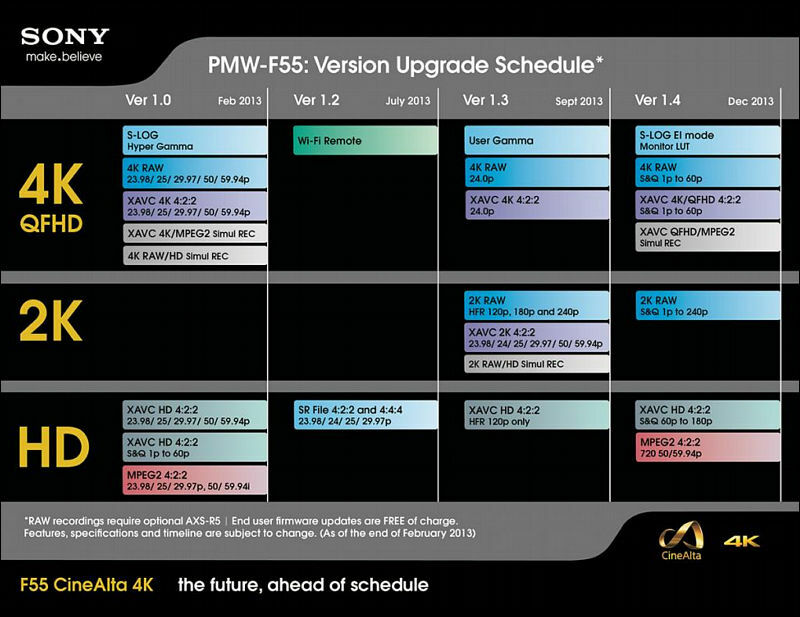 Notice how much the layout of the F5/55 resembles the Panasonic 4K pro "concept" camera they displayed at NAB last year? 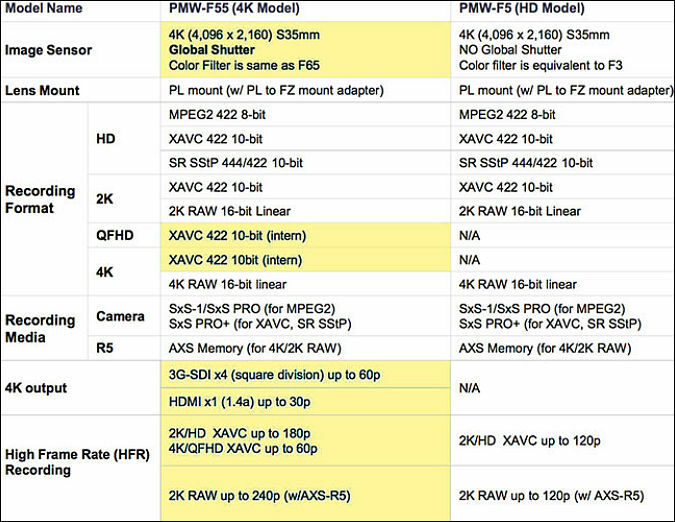 Panasonic and Sony are huge competitors and the F55 is the target Panasonic broadcast needs to answer. This looks like a really good camera for the commercial world! I think I like the S Log's properties better than the C Log's. Still, the price difference is enough to make me like the 1D as much as the F55. That was some of the better footage that I have seen from the 1DC @last_SHIFT 's filmmaker included. It felt more like a better representation of what I would shoot or look for in a side by side or test.